Boy was I happy to do a review for a Levaqua shower head! I have been using the same horrible shower head for 3 years and I was tired of it!! I rarely took showers because the pressure wasn’t enough to get the shampoo out of my thick, curly hair. It didn’t move at all and you couldn’t take it off the wall to get it closer to possibly give you a hand with the horrible pressure! Geesh! So in the mail came my life saver! 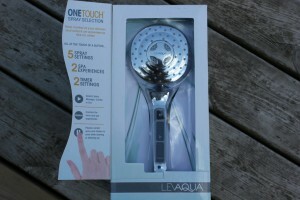 A Levaqua One Touch Digital shower head and boy was I excited. I had to wait until my hubbie came home because I was certain he would love putting it up for me. Now I know what your thinking…..hubbie has been at work all day and he probably is not super excited about putting up a shower head. Well, he may not have been super excited but he was in the bathroom about 5 minutes and came out saying “I’m done, and I didn’t even have to use any tools!” He said he just used a pair of pliers to get the old one off and that was it. I was a little skeptical but when I went to check it was ready to go. The Levaqua One Touch 9-function 4 in hand shower features built-in technology that allows you to easily select from 1 of 9 settings. I will describe some of the features for you below. Relax-5 minute cycle relaxes your body using the spray and ECO patterns! I especially like that it offers 2 Spa Experiences! You know, sometimes you just need a few minutes by yourself. With kids running around these 5 minute messages are like gold to me!! I finally have some pressure behind my showers and am able to get the shampoo out of my hair without struggling for 20 minutes and the Eco spray is great for helping to save on my water bill and helps the environment. It is great to have a luxurious spa experience without having to leave my own home. I found the shower head to be quite heavy but very durable. You can follow Levaqua on facebook and on youtube. That way you can keep up on the latest and greatest products that they have to offer! Don’t forget to enter to win your own shower head below! Good Luck!! **I received one or more of the products mentioned above for free. Regardless, I only recommend products or services I use personally and believe will be good for my readers.